Welcome, the Dodge Challenger Enthusiast Connection is a online world-wide, community dedicated to the preservation, restoration, and enjoyment of Dodge Challenger cars. 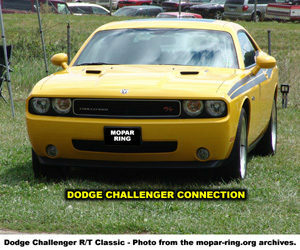 The connection was built to promote member sites of the Mopar Enthusiast Ring specializing in Dodge Challenger topics. Cruising the connection is a great way to locate Dodge Challenger related information, web sites and owners on the internet. We are a proud group of automobile enthusiasts with a common interest of preserving and enjoying our classic and modern Dodge Challenger cars. The Dodge Challenger Connection Member list is 100% comprised from member sites and pages of the Mopar Enthusiast Ring. Hand picked by the Ringleader, only member sites with pages or resources devoted to Dodge Challenger topics are considered. The Connection also features a great link section to other non member Dodge Challenger resources. Have a Dodge Challenger web site or page and want to get listed? The Connection is a great resource for promoting your site or page To be considered for the list you have to be a member of the Mopar Enthusiast Ring in good standing. Joining is totally free and is a great way to get more people to visit your Dodge Challenger site or page. For more information on joining visit here. The Dodge Challenger made its debut in the fall of 1969 as a 1970 model. And although it lasted only five model years, the Dodge Challenger became one of the most storied muscle car nameplates in automotive history. The Dodge Challenger returned in 2008 with the reveal of the 2008 Dodge Challenger SRT8 at the Chicago Auto Show. The modern Dodge Challenger offered ground shaking performance, unmistakable design cues reminiscent of the original Challenger, world-class ride and handling characteristics and benchmark braking. The Dodge Challenger Connection is part of the internets oldest and largest Mopar Enthusiast Ring, featuring over hundreds of Chrysler, Dodge, Dodge & Ram Truck, Plymouth and Mopar sites and pages. Including a collection of Mopar related Clubs and Parts & Services sites. The mopar-ring.org server also hosts some other cool Mopar related resources. Including a Classifieds section, Photo Gallery, Screensaver section and a news section.